Edgar Cabral does not have any MLB stats for the season. Draft: 2015, Philadelphia Phillies, 11th rd. Edgar Emmanuel Cabral… 2015 graduate of Mt. San Antonio College (CA)…Hobby: Spending time with family…Signed by: Demerius Pittman. Began the season with Lakewood (A)...Selected as a South Atlantic League midseason All-Star...Named Phillies Minor League Player of the Week, 6/5-11...Threw out 46.3% of attempted base stealers (36-67)...Promoted to Clearwater (A) on 7/27, where he finished the season... Batted .313 (21-67), 4 2B, 2 HR, 12 RBI, 15 R and an .860 OPS over 19 August games...Hit .385 (10-26) vs LHP with Clearwater...Played in 14 games for Glendale in the Arizona Fall League (.298, 14-47, 2 2B, 4 RBI). 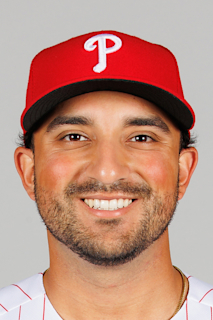 February 24, 2019 C Edgar Cabral assigned to Philadelphia Phillies. July 7, 2018 Clearwater Threshers activated C Edgar Cabral from the 7-day disabled list. July 4, 2018 Clearwater Threshers placed C Edgar Cabral on the 7-day disabled list retroactive to July 3, 2018. April 28, 2018 Clearwater Threshers activated C Edgar Cabral from the 7-day disabled list. April 19, 2018 Clearwater Threshers placed C Edgar Cabral on the 7-day disabled list retroactive to April 17, 2018. January 17, 2018 Philadelphia Phillies invited non-roster C Edgar Cabral to spring training. July 27, 2017 C Edgar Cabral assigned to Clearwater Threshers from Lakewood BlueClaws. March 27, 2017 C Edgar Cabral assigned to Philadelphia Phillies. August 6, 2016 Lakewood BlueClaws activated C Edgar Cabral from the 7-day disabled list. July 15, 2016 Lakewood BlueClaws placed C Edgar Cabral on the 7-day disabled list retroactive to July 14, 2016. June 23, 2016 C Edgar Cabral assigned to Lakewood BlueClaws from GCL Phillies. March 3, 2016 C Edgar Cabral assigned to Philadelphia Phillies. June 22, 2015 C Edgar Cabral assigned to GCL Phillies. June 18, 2015 Philadelphia Phillies signed C Edgar Cabral.